There are hundreds of different kinds of mushrooms all over the world. Not all of them are edible, but the ones that are all have different uses in cooking. We couldn’t possibly tell you about every edible mushroom out there, but we can give you a jumping-off point of what to do with some of the most common mushrooms you can find and how to prepare them. You’ve probably heard of this mushroom. It’s possibly one of the most common types of mushroom. These are the ones you most often find in the grocery story. The young button-like mushroom can be used in salads and egg dishes – breakfast omelet, anyone? An aged Portobello mushroom becomes darker in color and has a meatier texture. In this form, they can be used as a meat substitute. They can be grilled or baked in the oven for your vegetarian friends. These are Asian mushrooms and have been used in Asian cuisine for many generations. They contain lots of Vitamin B, fiber and protein, so they make a great addition to your diet. They are becoming more and more popular in American cuisine and are becoming more available in your local grocer. Try them in a vegetable soup or a homemade stir fry. This probably won’t be the kind of mushroom that you use in your normal everyday cooking. As a matter of fact you will likely have a hard time finding them. Truffles are a very rare and a very prized mushroom in culinary arts. It’s really most widely used in fine dining. White and black truffles are the most commonly used in fine dining. But because they can cost upwards of $300,000, they are used very sparingly. It’s something that would be shaved on top of pasta or salads. It can be used to make truffle oil or truffle vodka and used in cooking to help make the pricey truffle last longer, but to also infuse the bold taste into the food while cooking. This is another rare, wild mushroom. Should you be able to find this mushroom, then you'd better make it the star of the dish. They can be fried or sautéed with garlic. And if you have any left over, they can be used in sauces or to make a vinaigrette. These grow in the wild as well. They grow on trees in small clusters. Their thin caps can be added at the end of making soups and stews. Or simply sauté them and use them as a side dish to any roasted meat dishes. These mushrooms are similar to white mushrooms, but more flavorful. It’s a hearty mushroom, making it good for roasting, baking, and stewing. Stuff the caps of these mushrooms with cheese and breadcrumbs to make an appetizer at your next party. 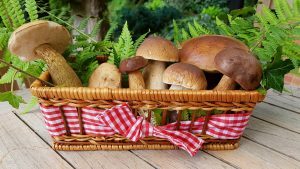 This is just the beginning of what there is available for edible mushrooms and the many amazing things you can do with them. There’s a whole big, wide world of mushrooms out there, so don’t just stop with these six.